Hope Sandoval (born June 24, 1966) is an American singer-songwriter who is the lead singer for Mazzy Star and Hope Sandoval & the Warm Inventions. Sandoval has toured and collaborated with other artists, including Massive Attack, for whom she sang "Paradise Circus" on the 2010 album Heligoland and "The Spoils" on the 2016 eponymous single. Hope Sandoval grew up in a Mexican American family in East Los Angeles, California. She attended Mark Keppel High School. In 1986, she formed the folk music duo Going Home with Sylvia Gomez, and recorded one album produced by David Roback, which has never been released. Sandoval performed with the band Opal in the late 1980s alongside David Roback and long-time Roback collaborator Kendra Smith. After Smith's abrupt departure during a tour of the UK (hurling her guitar to the floor at the Hammersmith gig), Sandoval took over lead vocals. At the end of the tour, Roback and Sandoval began writing together and formed the alternative rock band Mazzy Star. The first Mazzy Star album, She Hangs Brightly, was released in 1990. While not a commercial success, this album did establish Mazzy Star as a band with a unique sound. The band had a surprise breakthrough hit single released in October 1993. "Fade into You" – from its second album So Tonight That I Might See – was recorded one year before it became a success. There is a continuity between the sounds and moods established on Mazzy Star's first two albums and its third, Among My Swan. Sandoval formed The Warm Inventions in 2000 and released her first solo album Bavarian Fruit Bread in 2001, which she recorded with My Bloody Valentine drummer Colm Ó Cíosóig. The album differed in terms of theme, voice, and instrumentation from that of her work with Mazzy Star. Bert Jansch plays guitar on two tracks, and the album features two covers, "Butterfly Mornings" from the film The Ballad of Cable Hogue (1970) and Jesus and Mary Chain's "Drop". The Warm Inventions released two EPs, At the Doorway Again in 2000 and Suzanne in 2002 but did not win commercial success, with one video on MTV and little radio play. Sandoval recorded a song, "Wild Roses", for a compilation CD released by Air France, In the Air (2008). Hope Sandoval and The Warm Inventions released their second album, Through the Devil Softly, on September 29, 2009. Sandoval and her band were chosen by Matt Groening to perform at the edition of the All Tomorrow's Parties festival he curated in May 2010 in Minehead, England. The group also played the ATP New York 2010 music festival in Monticello, New York in September 2010 at the request of film director Jim Jarmusch. In 2009, Sandoval confirmed in an interview with Rolling Stone that Mazzy Star was still active: "It's true we're still together. We're almost finished [with the record]. But I have no idea what that means." In October 2011, the group released the single "Common Burn"/"Lay Myself Down", their first material in 15 years. The group stated that they had plans to release the album in 2012. In July 2013, "California", the first single from the new album was released. The album, Seasons of Your Day, was released in September 2013. On March 9, 2016, it was confirmed that Hope Sandoval & The Warm Inventions would release a 7" vinyl single titled "Isn't It True" for Record Store Day 2016. The track also features Jim Putnam of Radar Bros. A music video for the song was released on April 19, and is dedicated to Richie Lee of Acetone. The Warm Inventions' third studio album, Until the Hunter, was released on November 4 through the band's own independent record label, Tendril Tales. A second single from the album, "Let Me Get There" featuring Kurt Vile, was released on September 23. Sandoval contributed vocals to "I Don't Mind" by Psychic Ills, which was released on March 29. Four months later, Massive Attack released "The Spoils", which was her third collaboration with the band, following "Paradise Circus" and "Four Walls". A music video starring actress Cate Blanchett was released on August 9. During live performances, Sandoval prefers to sing in near-darkness with only a dim backlight, playing the tambourine, harmonica, glockenspiel or shaker. She has a reputation for shyness. Her stage presence has been described as "idly withdrawn, barely acknowledging the audience." Sandoval has collaborated with numerous other artists. ↑ Sandoval is listed as a featured performer on the song, as it sampled her vocals from "Fade into You". She did not have any direct involvement in its production. ↑ I Killed My Best Friend also features contributions from Sandoval's Mazzy Star partner David Roback, as well as The Warm Inventions' Colm Ó Cíosóig and his former My Bloody Valentine bandmate Kevin Shields. ↑ "Hope Inspires". HopeSandoval.com. Retrieved 2012-09-12. If I can't get the keyboard part, then he can get it, or vice versa. I'd rather not play guitar, but sometimes because I write the songs it's really difficult for somebody else to play it, they sort of don't interpret it the way it's supposed to be. And if he writes the song on keyboards, it's best that he plays the keyboard part. 1 2 3 4 5 "The Official Website of Hope Sandoval". HopeSandoval.com. Retrieved 2010-05-01. ↑ "BYT Interview: Hope Sandoval & The Warm Inventions". BrightestYoungThings. Retrieved 2010-05-01. ↑ "Frozen Entrée – Page 1 – Music – Los Angeles". LA Weekly. November 22, 2001. Retrieved 2010-05-01. ↑ O'Donnell, Kevin (July 6, 2009). "Mazzy Star Crooner Readies Return With Hope Sandoval and the Warm Inventions". Rolling Stone. Retrieved 2011-10-24. ↑ "Mazzy Star return for first release in 15 years". NME. October 18, 2011. Retrieved 2012-09-12. 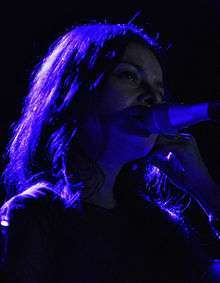 ↑ "Mazzy Star to release new album in 2012". NME. November 2, 2011. Retrieved 2012-09-12. ↑ Sterdan, Darryl (April 8, 2016). "Record Store Day 2016: The 25 biggest and best releases". Toronto Sun. Postmedia Network. Retrieved April 14, 2016. ↑ BrooklynVegan Staff (March 9, 2016). "Mazzy Star's Hope Sandoval releasing new album, but first a RSD limited 7"". BrooklynVegan. Retrieved April 14, 2016. ↑ Evan Minsker (April 19, 2016). "Mazzy Star's Hope Sandoval Shares "Isn't It True" Video: Watch". Pitchfork. Condé Nast. Retrieved August 10, 2016. ↑ BrooklynVegan Staff (April 13, 2016). "Tendril Tales is Hope Sandoval of Mazzy Star's label; website launches, RSD release already on eBay". BrooklynVegan. Retrieved April 14, 2016. ↑ Geslani, Michelle (March 28, 2016). "Mazzy Star's Hope Sandoval & The Warm Inventions prep first album in seven years". Consequence of Sound. Retrieved April 14, 2016. ↑ Andrew Sacher (August 22, 2016). "Kurt Vile sings on new Hope Sandoval and the Warm Inventions single". BrooklynVegan. Retrieved September 1, 2016. ↑ "Hope Sandoval And The Warm Inventions - Let Me Get There [10" Vinyl Single]". Amazon.com. Retrieved August 16, 2016. ↑ Jazz Monroe (March 29, 2016). "Psychic Ills Announce New Album Inner Journey Out, Share Hope Sandoval Collaboration "I Don't Mind"". Pitchfork. Condé Nast. Retrieved September 1, 2016. ↑ Shane Barnes (March 29, 2016). "Listen to Mazzy Star's Hope Sandoval on new Psychic Ills track". Flavorwire. Flavorpill Media. Retrieved September 1, 2016. ↑ Noah Yoo and Jazz Monroe (July 29, 2016). "Massive Attack Release "Come Near Me" New Video, Plus Hope Sandoval Collaboration". Pitchfork. Condé Nast. Retrieved July 31, 2016. ↑ Brian Josephs (July 29, 2016). "Massive Attack Release the Brooding 'Come Near Me' and 'The Spoils'". Spin. SpinMedia. Retrieved July 31, 2016. ↑ Ben Kaye (August 9, 2016). "Cate Blanchett stars in Massive Attack and Hope Sandoval's video for "The Spoils" — watch". Consequence of Sound. Retrieved August 16, 2016. ↑ "LiveDC: Hope Sandoval & The Warm Inventions @ Sixth & I". BrightestYoungThings. Retrieved 2010-05-01. ↑ McLaughlin, Moira E. (October 9, 2009). "Profile of Enigmatic Singer Hope Sandoval". washingtonpost.com. Retrieved 2010-05-01. ↑ "The Official Website of Hope Sandoval – Collaborations with other artists". HopeSandoval.com. Retrieved September 1, 2016. Wikimedia Commons has media related to Hope Sandoval.